Click to see update at bottom. While working on a website for a medical client Google launched symptom search to help you find answers to your medical issues. 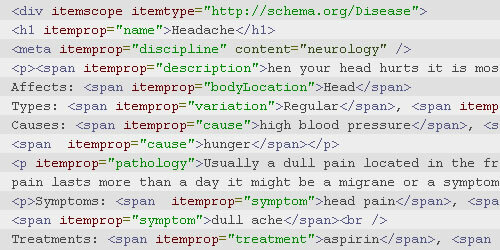 I wondered how Google would get more obscure symptoms and ailments cataloged in their index to handle searches and thought that Schema might be a solution. Unfortunately there is no schema for marking up medical listings for easy indexing. I decided to create a user facing schema to assist in indexing medical based microdata. Medical – An extension of Thing and is meant to be a parent category for all things medical. Just like the category Intangible it is not meant to be used to define a specific set of data and will probably not be used. The proper reference for the schema would be itemtype=”http://schema.org/Medical”. Though this does not exist it lets schema.org know that it is being used and should be considered for addition to the existing schema. The item properties are discipline and discoveredBy. Discipline would give an idea of what kind of doctors would know about the entry and discoveredBy is pretty self explanatory. Disease – This is meant to define anything that can adversely affect the human body including diseases, viruses, bacterial infections, parasites and other ailments even though these are not all considered diseases. I decided to disambiguate the list because using the proper classification does not help the end user find something they might not know how to classify. The item properties are bodyLocation (what areas the disease affects), variation (same disease, different version), pathology (description of disease), cause (a probable cause of the disease), symptom (a symptom of the disease) and treatment (a treatment of the disease). A disease can have multiple entries for bodyLocation, cause, symptom and treatment. MedicalTool – Any physical thing used in the medical world and can include hand tools, machines, syringes, pills and medicine. The focus of this is more technical as far as the manufacturer and what it might be used for. An medical item may be a Medical Tool and a Treatment at the same time (ie. medicine). The item properties include Treatment (a treatment the tool is used for), Manufacturer and Attatchment. Attatchment may be an extension of the existing item and can be defined as a tool if it is referred to indepenendly of the primary tool. Symptom – A noticeable affect where a person’s body is not behaving as expected. A symptom can be associated with a Disease or it can be a Disease (ie. headache). Item Properties include disease (a disease associated with the symptom), treatment (a treatment for the symptom) and affects (a body part the symptom affects). All of the itemprop items can have multiple instances. Also treamtents are sometimes meant only for the symptom and not the disease which is why it was included. Treatment – A process by which a symptom or a disease is partially or completely removed. A treatment can be applied to a Disease or a Symptom and can be a physical action or a MedicalTool (see above). Item properties include application (a disease the treatment is applied to), tool (a tool associated with the treatment), appliedBy (the Medical Professional who applies the treatment) and symptom (a symptom this treatment can be applied to). A treatment should have either a application, a symptom or both. The tool can be the treatment or associated with the treatment. MedicalTerm – Any term used in the medical field. There is no dictionary markup (might be my next project) so there needs to be something for medical terminology. Since the name and description should cover it for now, there are no additiona itemprops for this microformat. Now that you have the basics of the Schema be sure to checkout my schema page for more extensions to the format. I will be creating future blog posts for further explanation on each of these terms and how to properly implement them. For now you should be able to schema.org as well as my microformatting pages to figure out how to implement these rich snippets. Remember, this schema is proprietary. After going back and forth with people working with Schema.org they have created a new extension for schema.org. I’ll have to update this blog post.